The MultiPlex is suitable for all vehicle-types. 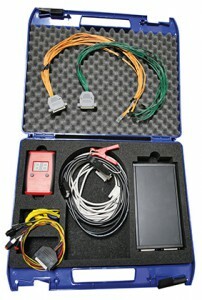 Universal pincables allow the connection of the device to different vehicle-control units. Additional adaptors are not necessary. The device is supplied with power through a standard-battery or via cable connection (with a car battery). With the help of a control element, which displays all present airbags, all pyrotechnic parts can be triggered via 2-finger-safety system. For recyclers, who already use the SEDA AirbagMaster, we recommend the MultiPlex upgrade-set. In that case the AirbagMaster is reused as control element. The MultiPlex components replace the previously required AirbagMaster-adaptors.